I requested this book from Tyndale House Publishers, but after I received it, I was a little anxious about reading it. I don’t like books or movies that scare me. I love mystery and suspense, but horror and torture just aren’t for me. When I read the back cover, the words “terrifying” and “terror” jumped out at me, so I put off reading it for a week or so. When I finally started reading Misery Loves Company, I was pleasantly surprised. This book packs plenty of mystery and suspense with just a touch of romance and nothing to yield nightmares. Jules Belleno writes book reviews on her blog and disappears after writing a negative review, in which she commented, “Don’t tell me it’s terrifying. Terrify me.” Her father and a local police officer begin unravelling the mystery surrounding Jules’ disappearance and the death of her husband, who died while on duty as a police officer, but things are not always what they seem to be to the characters or to the reader. This book has unexpected twists and turns and offers some insight into the world of writing fiction novels. I enjoyed reading this book and would recommend this book to friends and family. Once again, I have found a new author that I like by reviewing a book. This is a delightful story set in a small Texas community in the late 1800’s. 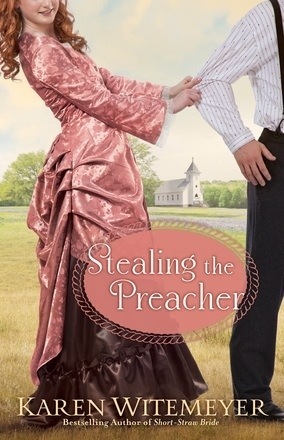 A reformed outlaw surprises his daughter with a preacher for her birthday, which sets in motion an interesting chain of events that offers several surprises along the way. I enjoyed the touching way the author portrayed the relationship between a father and his daughter and the way she had the characters deal with the deaths of family members. The characters wrestle with doubt, uncertainty, insecurity, stubbornness, and pride, but we are reminded that God is more powerful than any of these. This was the first time I had read anything by Karen Witemeyer, but I plan to check out some of her other books, especially Short-Straw Bride, which is the first book in this series. This book packed plenty of humor, romance, and suspense. I look forward to reading others by Witemeyer. I received this book free from Bethany House in exchange for an honest review. This review is my personal opinion.